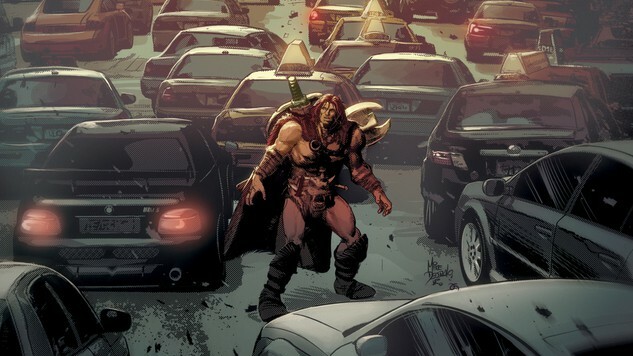 If you are true comic book aficionado, you will almost definitely know the name Mike Deodato. He is a comic book artist extraordinaire in almost every sense of the word. It seems that nearly everyone in the world has seen his work in one way or another. It is amazing to this about all that he has accomplished in his career. Because he is not a famous actor or celebrity, you might not even know that much about him. That is all about to change. Take a look at the following ten things that you did not know about Mike Deodoto. It seems that many people think that Americans have a lock on the comic book industry. That is obviously not the case, as Deodato proves. He is a famous Portuguese speaking comic book artist who has made his mark on various franchises throughout the years. He was actually born in Campina Grande, Brazil and still considers that to be his home to this day. You would have to go back to the year 1993 to discover where Deodato got his first real break as a comic book artist. That is when he went to work on designing the artwork that would look photo realistic and based on the hit television series at the time called Beauty and the Beast. This was published by Innovation Publishing and it would be his first move into the industry. While the Beauty and the Beast project was certainly successful, Deodato was still largely unknown outside of Brazil. That would all change when he went to work with William Messner-Loebs. William was the writer and Deodato would be the illustrator for Wonder Woman. This is how he would make his break into North America and would help him to become a well-known name in the industry. The rest, as they say, is history. After his initial successes, both in Brazil and then North America, everyone knew it would only be a matter of time before Deodato would be picked up nearly full-time by a giant in the business such as Marvel. That was the case, and he has been penciling sketches for them ever since. That would make it 24 years to be exact. Now that you know how long he has been with Marvel, it is time to tell you that he is leaving. He must feel that the time is right. He is currently working on a new run of Savage Avengers. It is after that project that he will say his final farewell to the company that has given him so many opportunities. He express his thanks to Marvel every chance that he gets, as do his many legions of fans around the world. We often wonder where somebody like Deodato got his talent in the first place. In this case, it truly was a case of like father, like son. His full name is Mike Deodato Jr. for a reason. Mr. Deodato Sr. was also quite the prolific artist in Brazil. It is true. These are comments that he recently made when he announced that he would soon be leaving the company. He was always passionate about art. When he was younger, he could think of nothing else but one day actually drawing the characters of Avengers, Captain America, and Spider-Man. Obviously, his dream came true. Deodato might be leaving Marvel, but he is not retiring. That is not even remotely on his mind. In fact, his goal is to devote himself to a series of creator owned comic books series on a full-time basis. We should see him back at it very soon. Before Deodato leaves Marvel for good, he is going to get to work with Gerry Duggan one more time. This will be the kick off for the new Savage Avengers. He has been looking forward to this collaboration. As he expresses it, this is a gift from Marvel. For his last project, he is going to be sketching all of the main characters from the franchise. This includes Wolverine, Conan the Barbarian, Doctor Voodoo, Punisher, and Venom. This should be quite the episode. Well, there you have it. Now you know much more about Mike Deodato. Hopefully, it will help you to appreciate his work even more as a result. He is not going anywhere, so keep an eye out for his work as he begin his next project.